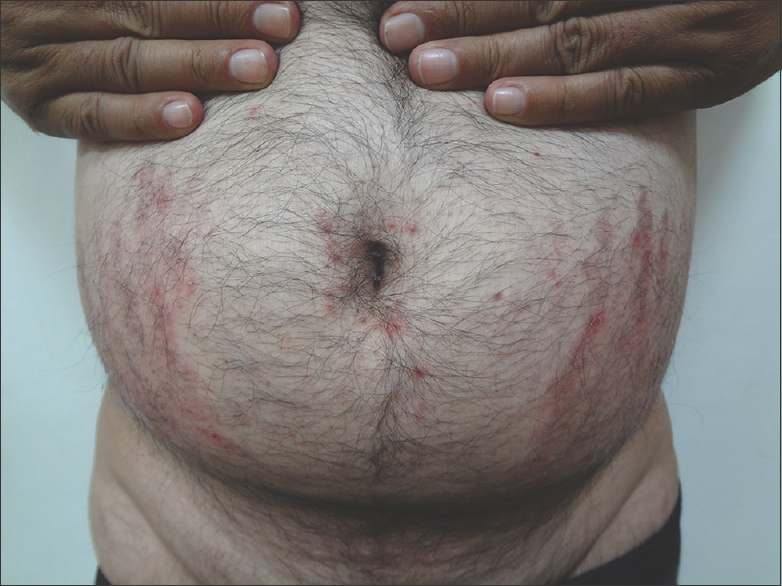 A 36-year-old male presented with multiple inflammatory striae which developed gradually over the past 15 days on his abdominal skin. He also developed acneiform eruptions over the face, trunk, and arms for the past 10 days. The patient was a known case of Crohn's disease for 10 years. He had been given oral prednisolone to the maximum dose of 60 mg/day, on and off over the past 10 years. Oral steroids were stopped 6 months back, and injection adalimumab was started in the dose of 40 mg subcutaneously every 15 days until date. He was not on any other oral or topical medication concurrently. Patient already had a few striae albicans over both axillae and thighs for 3–4 years. He started to develop new striae over the abdominal region for the last 15 days approximately 5½ months after beginning adalimumab, which was reddish and mildly tender associated with burning sensation [Figure 1]. There were no similar changes in preexisting striae over axillae and thighs. 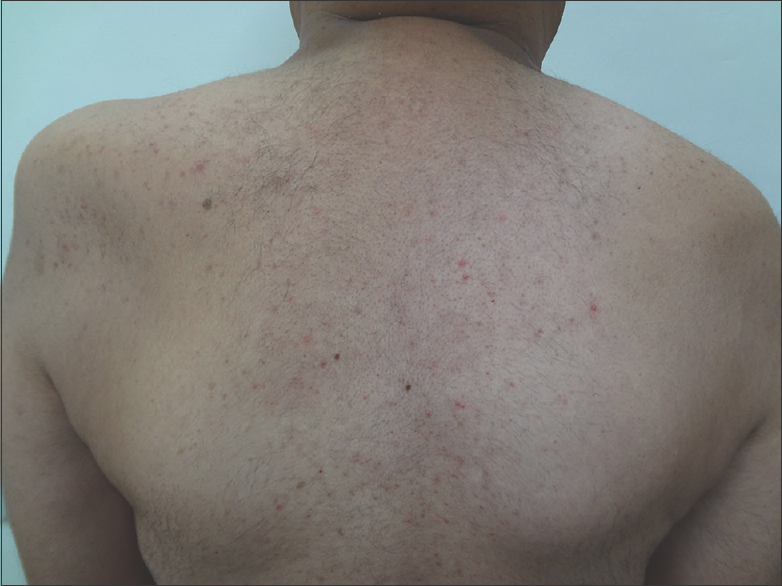 He also developed multiple erythematous papules and pustules over the face, chest, back, bilateral arms and forearms, and periumbilical region for the past 10 days which were slightly itchy [Figure 2]. The patient was started on topical retinoid cream for acneiform eruptions and emollient along with topical retinoid cream for striae and is under regular monthly follow-up. In an observational prospective study by Atzori et al., cutaneous reactions in patients with inflammatory bowel disease on adalimumab were observed as follows: Infections (32%), eczematous dermatitis (23%), infusion systemic reactions and at the injection site, paradoxical psoriasis onset or worsening (5.7%), followed by a mixture of different cutaneous reactions, including urticarial reactions, chronic lupus erythematosus, lichenoid eruption, erythema nodosum, and alopecia areata. The eruptive growth of benign lesions was also recorded (15%), mainly seborrheic keratosis and ruby angiomas, followed by neck and groins fibropapillomas. Preexisting herpes infections, steroidal acne, diffuse folliculitis, striae distensae, skin fragility with capillarity and one case of leukocytoclastic vasculitis were recorded and excluded from the study even if they continued to occur after exposure to adalimumab. Nonmelanoma skin cancer and basal-cell carcinoma have also been reported with TNF-α blockers. The immunological cascade triggered by the direct block of TNF-α, produces a parallel decrease in IL-1, decreasing endothelial permeability, leukocyte migration, and the inflammatory process., Hence, the effect produced in this patient is paradoxical because infliximab and adalimumab have been used successfully as off-label prescriptions in the treatment of acne conglobata, SAPHO syndrome. In conclusion, we highlight the need to deepen our understanding of the pathophysiology of such paradoxical reactions that are described here. It remains unknown why these types of drugs improve acneiform eruptions in some patients and worsen them in others. The development of inflammatory striae due to adalimumab was another unusual finding in this patient. This study was financially supported by the Department of Dermatology, Sir Ganga Ram Hospital, Rajinder Nagar, New Delhi, India. Hanauer SB, Sandborn WJ, Rutgeerts P, Fedorak RN, Lukas M, MacIntosh D, et al. Human anti-tumor necrosis factor monoclonal antibody (adalimumab) in Crohn's disease: The CLASSIC-I trial. Gastroenterology 2006;130:323-33. Zamora-Atenza C, Diaz-Torne C, Geli C, Diaz-Lopez C, Ortiz MA, Moya P, et al. Adalimumab regulates intracellular TNFα production in patients with rheumatoid arthritis. Arthritis Res Ther 2014;16:R153. Ternant D, Ducourau E, Fuzibet P, Vignault C, Watier H, Lequerré T, et al. Pharmacokinetics and concentration-effect relationship of adalimumab in rheumatoid arthritis. Br J Clin Pharmacol 2015;79:286-97. Furst DE, Wallis R, Broder M, Beenhouwer DO. Tumor necrosis factor antagonists: Different kinetics and/or mechanisms of action may explain differences in the risk for developing granulomatous infection. Semin Arthritis Rheum 2006;36:159-67. Singh JA, Wells GA, Christensen R, Tanjong Ghogomu E, Maxwell L, Macdonald JK, et al. Adverse effects of biologics: a network meta-analysis and Cochrane overview. Cochrane Database of Syst Rev 2011;(2):CD008794. Scheinfeld N. A comprehensive review and evaluation of the side effects of the tumor necrosis factor alpha blockers etanercept, infliximab and adalimumab. J Dermatolog Treat 2004;15:280-94. Atzori L, Mantovani L, Pinna AL, Pau M, Usai P. Cutaneous Adverse Reactions during Anti-Tnf Alpha Treatment for Inflammatory Bowel Diseases: The Experience of the Dermatology Clinic of Cagliari (Italy). J Pharmacovigil 2015;S2:004. Askling J, Fahrbach K, Nordstrom B, Ross S, Schmid CH, Symmons D, et al. Cancer risk with tumor necrosis factor alpha (TNF) inhibitors: Meta-analysis of randomized controlled trials of adalimumab, etanercept, and infliximab using patient level data. Pharmacoepidemiol Drug Saf 2011;20:119-30. Fernández-Crehuet P, Ruiz-Villaverde R. Acneiform eruption as a probable paradoxical reaction to adalimumab. Int J Dermatol 2015;54:e306-8. Sladden MJ, Clarke PJ, Mitchell B. Infliximab-induced acne: Report of a third case. Br J Dermatol 2008;158:172. Steels E, Peretz A, Vereecken P. Infliximab-induced acne: A new case and review of published reports. J Dermatolog Treat 2009;20:59-60. Sun G, Wasko CA, Hsu S. Acneiform eruption following anti-TNF-alpha treatment: A report of three cases. J Drugs Dermatol 2008;7:69-71. Shirakawa M, Uramoto K, Harada FA. Treatment of acne conglobata with infliximab. J Am Acad Dermatol 2006;55:344-6. Fruehauf J, Cierny-Modrè B, Caelen Lel-S, Schwarz T, Weinke R, Aberer E, et al. Response to infliximab in SAPHO syndrome. BMJ Case Rep 2009;2009. pii: bcr10.2008.1145.